The district monastic body and government administrative offices of Paro are housed in this large monastery called Rinpung Dzong or Paro Dzong. 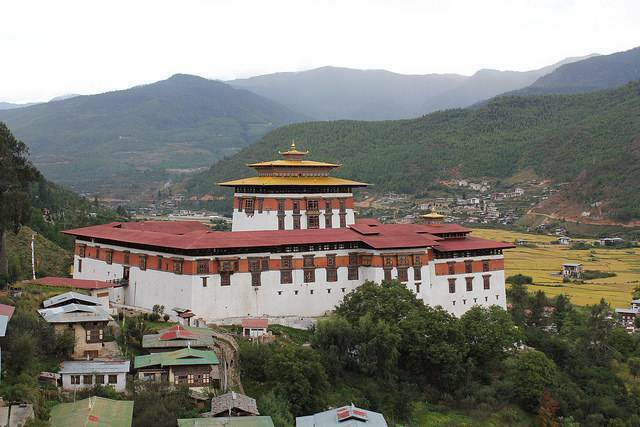 It is also a fortress of the Drukpa lineage of Bhutan. It was sanctified by Shabdrung Nawang Namgyal in the year 1645. This place is regarded as one of the finest examples of Buddhist monastery. The name Rinpung Dzong means ‘Fortress on a mountain of jewels’. Visit this place in the month of March or April and you will be amazed to the celebration of the annual festival in this monastery. Different sacred images are taken on a procession along with mask-dances that tells us various religious stories. There are also fourteen shrines and chapels inside Rinpung Dzong. Some of them are Temple of the Guru’s eight Manifestations, Chapel of Amitayus, Apartments of the Abbot, Chapel of Akshobhya, and Temple of the Bursar while outside the monastery there is the Deyangkha temple. This monastery is just above a bridge called Cantilever Bridge. It has been listed as a tentative site under the UNESCOs inclusion of Bhutan’s Tentative List.